The Arrival section of this website tells the story of the arrival in New Zealand of the first group of New Zealand Company settlers on the Oriental. It also documents the life of Cecilia Eliza Herbert, and her three husbands, Charles Rodgers, Richard Rush and John George Rush. The "Oriental", under Captain Wilson, was the first of the New Zealand Company's ships to sail from England, and, 107 days later, the second to reach New Zealand. The 506 ton barque, with 155 passengers on board (62 male and 93 female), sailed from Gravesend on September 15th, 1839. The ship called at the island of Santiago in the Cape Verde Group, which was the last land sighted until January 22nd, 1840, when she entered Port Hardy on the northern coastline of D'Urville Island. On that same day another New Zealand Company ship, the "Aurora", reached Port Nicholson. ("Aurora" had sailed from London three days after Oriental). Natives who paddled by the "Oriental" in their canoes, while she lay at anchor in Port Hardy, told of a white man living on the island with the Maoris. This proved to be a Scottish sailor by the name of McLaren, who delivered a letter from Colonel Wakefield ordering the "Oriental" to Wellington. It was another three days, however, before the strong wind blowing into the harbour eased enough to allow "Oriental" to sail once more, and here the voyage very nearly ended in disaster when the ship narrowly avoided being blown onto the rocks known as Nelson's Column. By January 29th, the "Oriental" was off Port Nicholson, and then the wind failed, forcing the anchor to be dropped. Two days later Wakefield arrived by boat, bringing with him a pilot, and although there was a head wind the "Oriental" managed to beat her way into the harbour, receiving a gun salute from the Aurora, and another vessel, "Cuba". 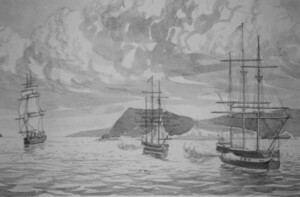 "Oriental" finally dropped anchor off Somes Island at 6 pm on January 31st, 1840. For a few more days the weather was rough, but on February 3rd a fine spell set in, and on the 5th the work of disembarking passengers and stores began in earnest. It had been decided to settle the new arrivals on the banks of the Hutt River, about a mile up from the mouth at "Pito-one" beach, and while the ships' boats were used to take heavy articles up the river the bulk of the passengers tramped to their new home along a rough track, carrying most of their possessions in their arms or on their backs. The last of the passengers were living ashore by February 15th, and by the 6th of March the last of the cargo had been unloaded and ferried ashore. Until bush could be cleared, and shacks built, the new settlers lived under canvas supplied by the "Oriental". 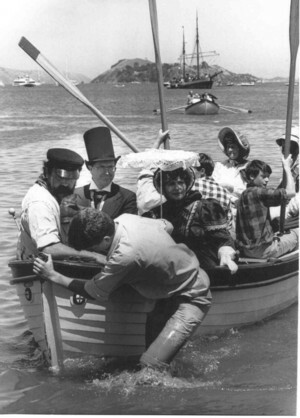 You can read more about the first immigrant ships on the private website of Anthony Flude 2001.